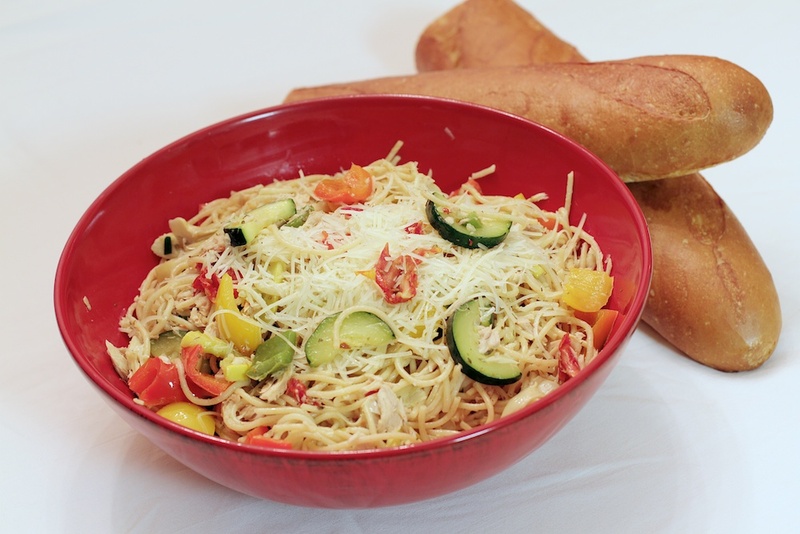 Here’s an easy and delicious pasta dish, made with vegetables and tuna. Boil water and cook your pasta until it’s al dente, adding a few tablespoons of olive oil to the water so the pasta won’t stick. Once cooked, set the pasta aside. Cut the zucchini and yellow squash in half the lengthwise, then slice into pieces about 1/4 inch thick. Set aside. Cut the bell peppers into pieces about 1 inch square. Set aside. Drain the tuna. Set aside. Cut the artichoke hearts and sun dried tomatoes into thin strips. In a wok, heat a few tablespoons of olive oil. Add the garlic to the hot oil and stir briefly. Add the zucchini, yellow squash and bell peppers to the wok and stir. Add a few tablespoons of water, then cover the wok to steam the vegetables until tender. Add salt, oregano and red pepper flakes to taste (you’ll re-check the seasoning after adding the pasta). Add the cooked pasta and about 1/4 to 1/2 cup of olive oil (enough to coat the pasta). Add the sun-dried tomatoes, artichoke hearts and tuna, then stir. Re-season according to taste, then serve.